As I have already explained, I have joined the writing/contributing team of Vada Magazine. My second feature for Vada Magazine was about The Universal Machine: A New Musical about the Life and Death of Alan Turing. The Universal Machine: A New Musical about the Life and Death of Alan Turing told Alan Turing’s life story, beginning with his school days at Sherbourne, through his time at the infamous Station X at Bletchley Park during World War Two, and culminating with his arrest for homosexuality and his tragic death. Turing’s story was about someone who was a genius, who contributed significantly to winning the War for Britain (by cracking the Enigma Code), who invented modern-day computers, but who was not “normal” by British society’s standards at that time – he was different. The production showed the very high price that Turing paid for being different at a time when you had to conform to society’s norms. It reminded me that we should be thankful that in today’s British society being different is allowed and permitted and is something that can be positively celebrated. I wanted to write about Alan Turing because I feel he was a truly extraordinary and remarkable individual. I went to see this production as I wanted to learn more about Alan Turing. When I first heard that the theatre company was staging Turing’s life story as a musical, I was deeply sceptical. However, when I saw the production my doubts evaporated as it was excellent. The production really worked and I enjoyed it immensely. It brought that period in British history to life – I was transported back to Sherbourne, to Bletchley Park, and to Manchester postwar – as it told Turing’s life story in depth, with integrity and compassion. I found the production very powerful and deeply moving. The first section is about Turing’s school days at Sherbourne. There is a whole sequence about the school’s focus on sports, games and on competition, and how this was not Turing at all. The school shared his mother’s opinion of Turing that he was not “normal”, whatever “normal” was. 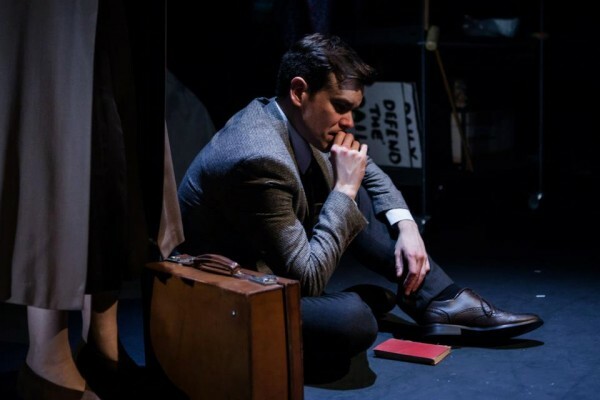 The production very effectively conveyed Turing’s sense of isolation at the school, until he meets Chris, a fellow student, with whom he shares a love of Maths and a highly intelligent mind. They form a very deep friendship and a profound bond. Turing and Chris make plans to go to Cambridge together, but Chris dies of TB before this comes to pass, leaving Turing isolated and alone again. This broke my heart, and I really felt Turing’s loss of the one person in his life so far who had truly understood and cared about him. The action then moves to Bletchley Park during World War Two and the various attempts to crack the Enigma code. It is here that Turing has the genius idea of designing and building a machine, as machines can think so much faster than humans. You get the impression that when Turing was working, and using his brain to its maximum potential, he found real fulfilment in his work. Turing was one of the key people who helped win the War for Britain by cracking the Enigma code, although his personal contribution was secret and therefore never acknowledged or recognised as it should have been. The musical explored Turing’s engagement at this time – his attempt to be “normal” and to lead a “normal” life; one that would be accepted by British society at that time. With the War won, Turing’s work is done and his papers and his machines are destroyed. You get the feeling that with his top secret and important work gone, his life going forwards would be empty and without purpose, especially because he could not live the life that he wanted, openly and without shame and persecution – the life of a gay man. The final section deals with Turing’s fall from grace (he admitted a relationship with another man), his prosecution, his chemical castration, and his suicide. Unable to live a life true to himself, and with his work gone, there is little point in going on and he commits suicide. I found it very touching that his mother refused to accept that her son had committed suicide “he was not weak”. She wanted to prove that it had all been an accident; a scientific experiment that had gone wrong. The focus of Turing’s work was on looking at the question “Can machines think?”. In this, as in so many other ways, Turing was well ahead of his time. We now have machines and computers that are intelligent, that can “learn” and adapt based on their “learning”. Turing’s story was about someone who was a genius, who contributed significantly to winning the War for Britain, but who was not “normal” by British society’s standards at that time – he was different. The production showed the very high price that Turing paid for being different at a time when you had to conform to society’s norms. It reminded me that we should be thankful that in today’s British society being different is allowed and permitted and is something that can be positively celebrated. The whole cast were excellent, but Richard Delaney, playing Alan Turing, was exceptional. He brought Turing to life, as a fully rounded 3-dimensional character with integrity. This production told the life story of a truly extraordinary individual who was different at a time when, to be accepted, you had to conform to society’s norms. It brought Turing’s life story to a new audience and that is very important as I believe that more people, in the UK and abroad, should know about Alan Turing, his life, and his remarkable contribution. The Universal Machine: A New Musical about the Life and Death of Alan Turing ran from 16 April to 11 May 2013 at the New Diorama Theatre and was part of the Alan Turing Centenary Celebrations.